It’s not everyday that I get to feel like I’m living in history, but that’s exactly how I felt looking at the rolling hills of Athens from the top of the Acropolis, images from 300 flashing in and out of my head (I know I know 300 is Sparta not Athens). I was on my way to Iceland from Singapore after attending a trade show on the island nation. There were no direct flights available; what’s more, there wasn’t even a simple connecting option that I could book. The only itinerary available was to spend 13 hours in Athens, before flying to Stockholm, then finally to Reykjavik. I was fretting about the amount of time I had to spend at the Athens airport and frantically reading reviews about how good the airport was, when I remembered that I’ve never actually been to Greece before. Suddenly feeling adventurous, I decided to turn this situation into a proverbial lemonade and explore Athens for a day. The first step was to actually figure out how much of Athens I could see in 13 hours on my own. 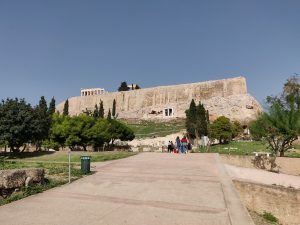 From all my research, it seemed like the the area centered around the Acropolis was the most interesting and historically significant area of the city. Many ancient monuments are scattered around in this area, and its size is compact enough that I could reasonably get around on foot. 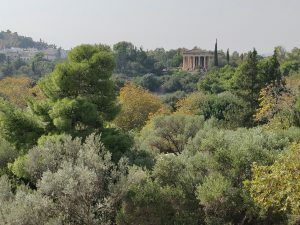 This area is home to Acropolis, the ruins of a large temple complex and the symbol of Greece; the Agora, the hub of civic and commercial life of ancient Athens, now a massive collection of building remains from that era; and a host of other amazing archeological sites. 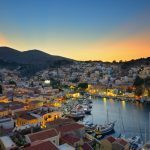 It’s also quite a bustling center of modern life, with places like Plaka, one of the poshest neighborhoods in Athens; Syntagma Square, where the Greek parliament is located; and Ermou Street, a busy commercial thoroughfare with lots of bars, restaurants, cafes, and shops. Feeling pretty good about my plan for the day, I boarded my flight in Singapore and slept all the way until landing. The airport was functional, though to be honest I thought it was rather poorly designed. It took me more than 30 minutes to walk from the gate to the customs, which combined with early morning and my two heavy pieces of luggage had made me pretty grumpy by the time I made it through. First thing I did after exiting the airport was storing my luggage. I needed only my phone and camera for this excursion, so I checked everything else into the storage that’s conveniently located at the arrival hall. Price was reasonable, costing only 13.5 euros for 12 hours. After that, I boarded the metro Blue train, which took me from the airport to Syntagma Station in around 50 minutes. While sitting on the train, I had two locals warning me to mind my camera; apparently there are many thieves who prey on tourists on the metro. From Syntagma, I connected to the red train for just one stop to Acropoli station. This is the station you want to use to access the Acropolis. It’s located in the Plaka neighborhood and is only 300 yards or so away from the ticket office to Acropolis. Walking towards the Acropolis was surreal; it felt like I was about to meet a movie star. As I got closer to the base, it became apparent to me just how impressive the Acropolis was as an architectural marvel. The temple complex sits on top of a massive walled base, which itself is built on top of a white limestone hill. All I could see from the ground was a massive vertical stone wall against the blue sky, looking like a giant ship sailing towards the sun. The temples on top looked so small from where I was, accentuating the size of it all. 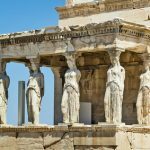 A tip I have for visiting the Acropolis is to purchase your admission online ahead of time. I stood in line for almost 40 minutes to buy my ticket, and I can only imagine the line is even longer in high seasons. Once I got into the archeological site, I started my slow ascent towards the temples. All along the path uphill are other beautiful ruins, including two big amphitheaters, one in shambles and the other restored to usable conditions. It’s part of the protected heritage site now, but this whole area used to be inhabited by residents of Athens. They built houses, shops, and temples on the slopes of the Acropolis, in whose shadows they lived about their daily lives. As I went higher and higher, I started to get a clearer view of the city around me. 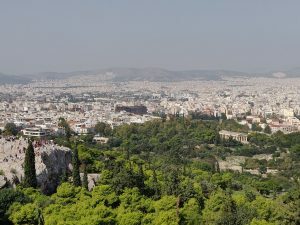 It’s not an exaggeration when I say that Athens has one of the most beautiful urban layout anywhere in the world. The city is not flat, but rather it’s built on an undulating expanse of slopes following whose contours neighborhoods also ripple up and down. 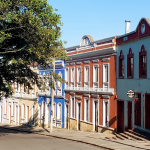 White-walled buildings make up most of the city, going as far as my eyes could follow. Punctuating the sea of white houses are a couple of steep forested hills that look like guards watching over the city. After about 50 minutes of slow climb, I finally got to the gates of the temple complex on the very top. The size and austerity of the stone pillars impressed the historical importance of what lies behind it, and crossing the threshold actually felt like going back in time. The temple complex is quite big, with the Parthenon to the right and the Temple of Athena Nike to the left. The ground of the complex is made up of large slabs of marble, uneven in most sections due to millennia of neglect. I walked counterclockwise around the edge of the complex, admiring the unobstructed view of Athens from the top. There is a water fountain towards the eastern part where you can drink from and fill up your water bottle with. At the eastern tip of the complex, beneath the giant Greek flag, is a viewing platform that allows you to look back at the Parthenon in all its glory. After I made my way down from the Acropolis through the western exit, it was almost 2pm and I was getting pretty hungry and weak. 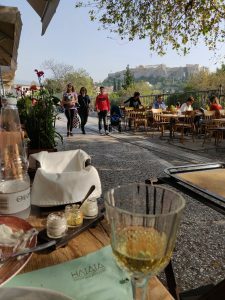 I knew that there are a lot of nice restaurants in the Plaka neighborhood, but that was on the opposite side of the Acropolis and I didn’t have the energy to walk back all the way there. Instead, I kept going towards the Agora, and happened upon a lovely pedestrian street with a fantastic view of the Acropolis, called Adrianou Street. The street runs along northern edge of the Agora from Monastiraki metro station to the east and Thissio metro station to the west. It’s lined with upscale restaurants, most of whom have outdoor patios. I looked at a couple of menus and they all seemed similar to one another, so I picked the one with the best view of the Acropolis. The food was delicious. For my appetizers I got a tzatziki and another dip whose name I forgot. For my main I got a lamb steak, which was fantastic. I definitely over ordered but I was enjoying it all even after I was full. After lunch, I took it easy. Since the Agora was just across the street from me, that’s where I went first. The Agora was the commercial center of ancient Athens. It contained courthouses, a mint, a number of temples (the most famous and intact one being the Temple of Hephaestus on the western end of the Agora), lots of shops, and a host of other public and commercial buildings. Of course, very little of these buildings remain; what you see today is mostly ruins of these buildings. While at the Agora, I tried to imagine what the area would’ve looked like in the ancient times. 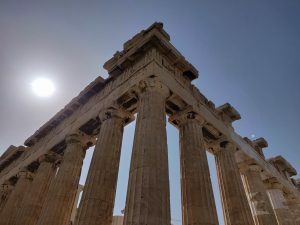 I pictured all the houses around me intact with their white walls and orange roofs, people in tunics walking around me talking fast in what I thought ancient Greek sounded like, and priests being carried to the temple on the main thoroughfare. For a split second I succeeded in immersing myself in that world; all modern presence around me suddenly disappeared and I was actually in ancient Athens. But alas, the moment left as quickly as it came, and I was back amongst the ruins. After spending about an hour at the Agora, I walked towards Syntagma Square, the civic center of modern Athens. The street got busier after I got past the Monastiraki Square, marking the beginning of the most bustling stretch of Ermou Street. By this time I was pretty exhausted. 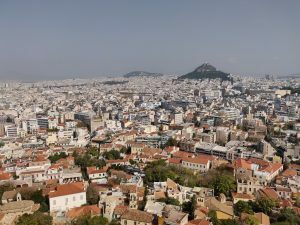 I waded through the sea of shoppers on Ermou, skipping all the cool businesses I saw and headed straight toward Syntagma Square where the shuttle bus back to the airport was waiting for me like a lifeboat. When I finally got to Syntagma Square, I spent 5 minutes quickly pacing around it to give it a look. It’s a nice square, but nothing about it stood out for me. I learned after the fact but there’s a change of guard ceremony that takes place in front of the parliament building on the eastern edge of the square. Unfortunately I didn’t know about it at the time so I missed the ceremony. I spotted my bus on the southeastern corner of the square. The shuttle bus is route X95 and it costs 6 euros to the airport and takes about 50 minutes. I think I passed out on the bus pretty hard because as soon as snapped out of it I was at the airport. Looking back at my day, I’m glad to have spent it exploring the city. It was extremely exhausting but I got the chance to experience one of the most famous landmarks in the world. Of course, Athens has much more than just the Acropolis to offer. 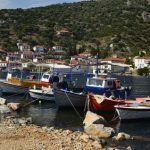 It has countless museums, beautiful neighbourhoods, amazing food, and the lovely port town of Piraeus. On my flight to Stockholm, I already started think about a properly visit Athens again, as well as the rest of Greece. Hopefully I get to do it soon! Wow Dave, this is a nice plan in this kind of situation. Your photos are just amazing. … but i need to go back to greece and do a photography focused trip – want to join me? !